Day Four of My Twenty Five Days of Christmas is a day many Chattanoogans have looked forward to for a long time, and especially since news broke back in the summer. The Cheesecake Factory Is Opened In Chattanooga. I was invited to attend a training session, or soft opening this past week. Of course we were excited to try it out, although we have eaten at The Cheesecake Factory many times and always say “Chattanooga needs a Cheesecake Factory”. Although the meal was provided, I have reviewed it with my own opinions. The restaurant layout and decor is very warm and golden in a Tuscany decor as are all The Cheesecake Factory we’ve been to. At most of these openings, the menu is usually pretty limited. The extensive menu offered by The Cheesecake Factory is almost like a book so I wasn’t surprised when there was more than the normal tastings offered. With over 250 items offered on the menu, just think how many times you can go and try something new. Or share and you both get to try it. Sean our server, was very attentive and was still being shadowed by a trainer. Several from the corporate office were here to help with the opening and all the training to bring their service and food up to The Cheesecake Factory standards. I also found out they were opening another restaurant in Lubbock, Texas at the same time. A few drinks were offered from the bar for $1 with all of the money going to charity. 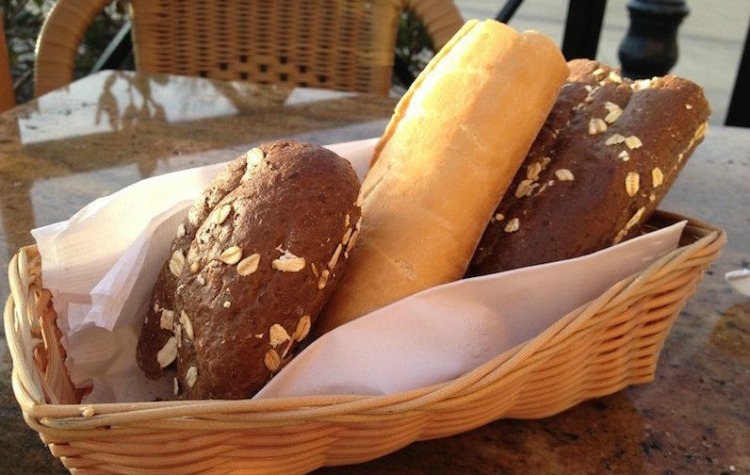 The meal always begin with their signature oat-topped brown bread and sourdough bread with real butter. I could make a meal on the brown bread. I hear you can now buy it in some supermarkets, but haven’t seen it here. If you do, let me know. One appetizer per table was offered and we chose the Warm Crab and Artichoke Dip. 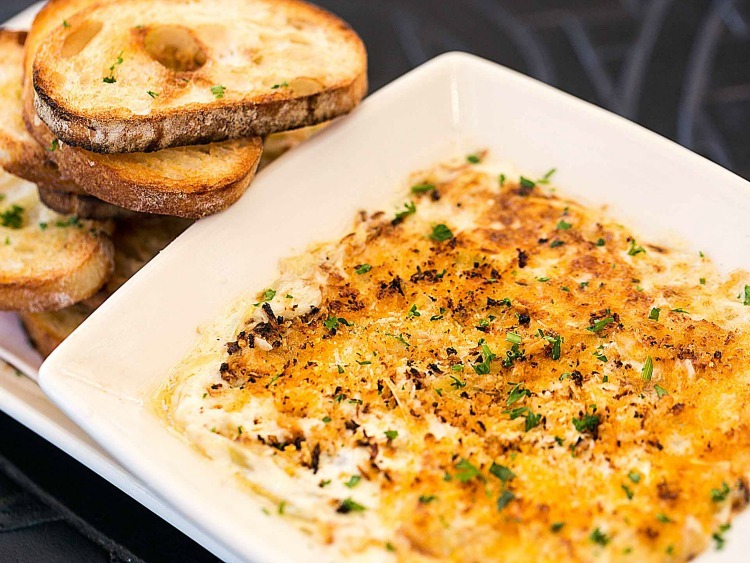 It was a very good choice with the delicious blend of crab, artichokes, and cheese served with warm grilled bread. You could really taste the crab which is sometimes missing in dips. 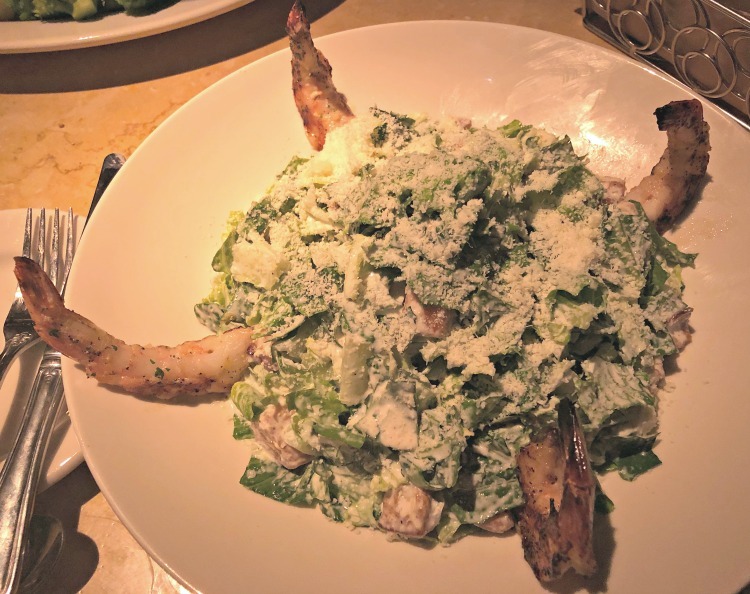 For entrees, I chose Caesar Salad with grilled shrimp added. The dressing was wonderful but I will be honest and say there was way too much on it and I sent it back. I was offered another salad but after eating the bread, appetizer, shrimp and part of the salad, I was good. The salads are huge so consider sharing with one or two more. The almost traditional recipe includes croutons, Parmesan Cheese, and their own special Caesar Dressing. 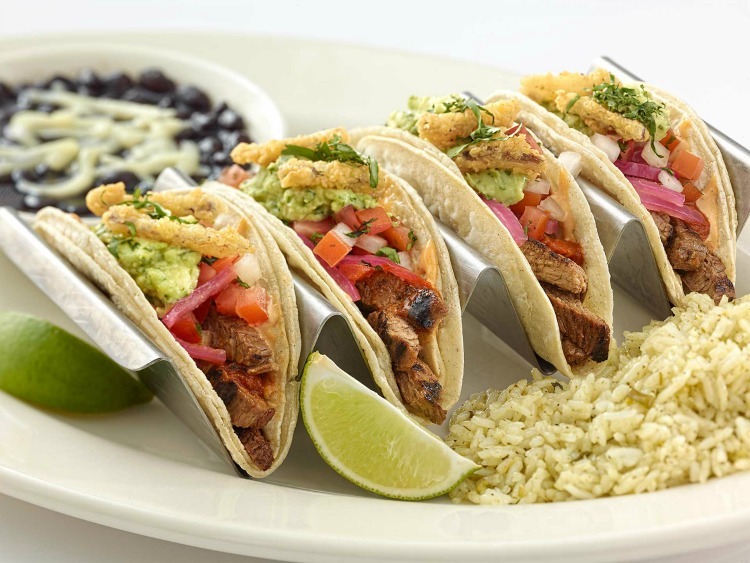 Don chose Grilled Steak Tacos, which are soft corn tortillas, chargrilled steak, avocado, tomato, chipotle sauce, crispy onions and cilantro. It was served with rice and beans. Presentation is always good and Don said it was very tasty. Would he order again? Yes it’s on our “order next time” list. 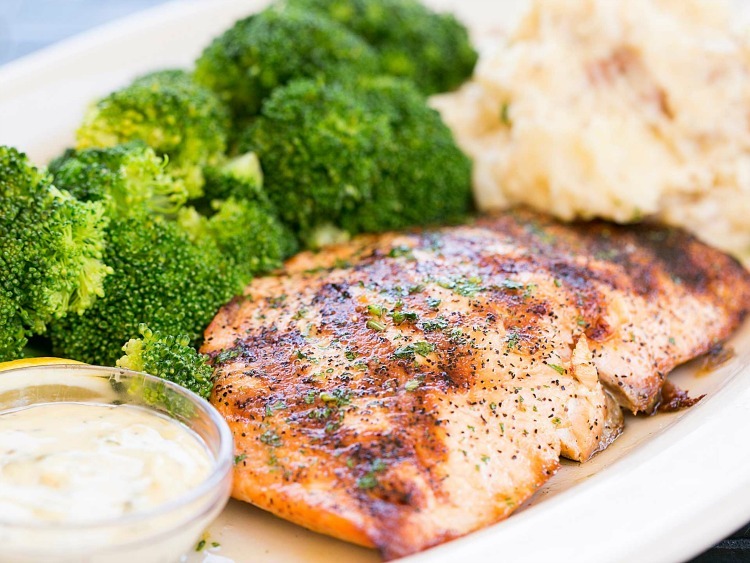 Doug had the Fresh Grilled Salmon, which came with mashed potatoes and steamed broccoli. The Garlic Aioli was just that little extra which took the Salmon over the top. Another thumbs up. As you would guess, The Cheesecake Factory, signature dessert is cheesecake. Offering over 30 varieties, a with a holiday offering of Peppermint Bark Cheesecake is the white chocolate cheesecake swirled with chunks of chocolate peppermint bark, topped with white chocolate mousse and finished with chopped peppermint. Doesn’t this just say Christmas to you? Think about ordering a whole cheesecake for any of your holiday parties. Full disclosure here, I don’t like cheesecake as I had an unfortunate experience many years ago and just cannot eat it. I do try it sometimes, but it’s a no for me. 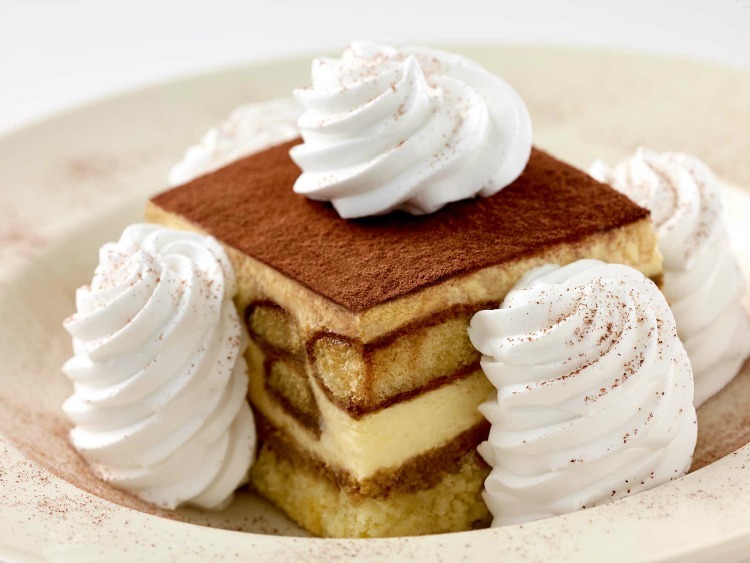 BUT – my all time favorite dessert, and I think the BEST comes from The Cheesecake Factory is Tiramisu. I have been known to make a trip by The Cheesecake Factory and bring it home even if we have eaten elsewhere. The Italian Custard Made with Mascarpone, Whipped Cream, Lady Fingers, Marsala and Coffee Liqueur then Topped with Whipped Cream and Ground Chocolate, it just doesn’t get any better for me. Oh my goodness it was good. With a great cup of coffee, I couldn’t begin to eat even a fourth of it, so it boxed up by Sean so I could enjoy at home. 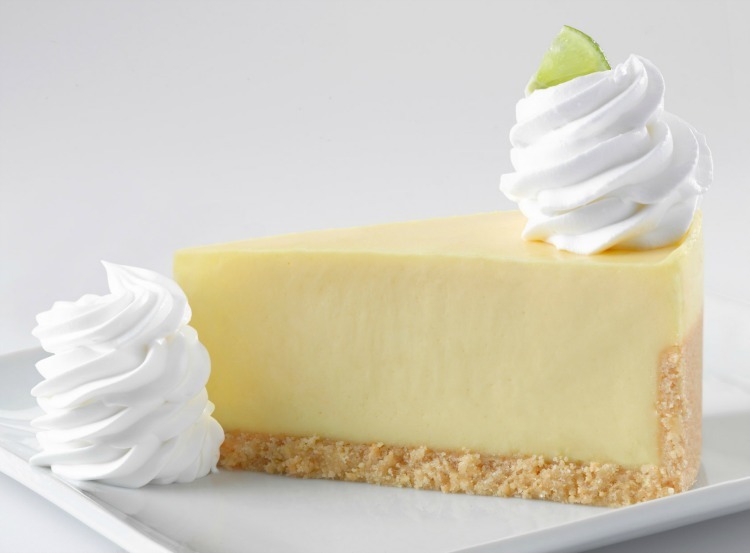 Don is the Key Lime Pie person, so he tried the Key Lime Cheesecake and loved it. Again, a huge piece after a big meal, so he had leftovers also. It is Deliciously Tart and Creamy on a Vanilla Crumb Crust. Does this make you want to visit? 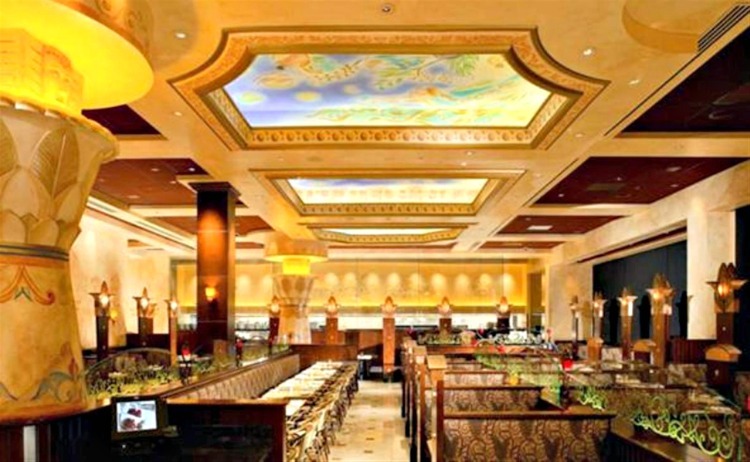 Have you eaten at The Cheesecake Factory before? If so, what’s your favorite food and dessert? I didn’t even get around to mentioning the drink selection at the bar. Happy Hour each afternoon, Monday – Friday, 4 – 6 with several drink and appetizer specials for $6.50 at the bar. Make the weekends a bit better by checking out their Brunch Menu on Saturday & Sundays, 10 – 2. You will find several additions of eggs, omelettes, waffles, and my favorite, Lemon Ricotta Pancakes. No time to dine? Their entire menu is available for take out. Just order and it will be brought to your car curbside. Hours and information on parking is included on their website link. Make sure you check out all of the menu items and information about the new Chattanooga location. Now let’s make a date and go have lunch.